In common with all Japanese Navy aircraft the Zero had an identification or designation stencil painted on to the rear left fuselage. This three or four line stencil listed the manufacturer of the airplane in the top line, the plane’s serial number in the second line, and, until towards the latter part of 1942, the plane’s date of manufacture in the third line. 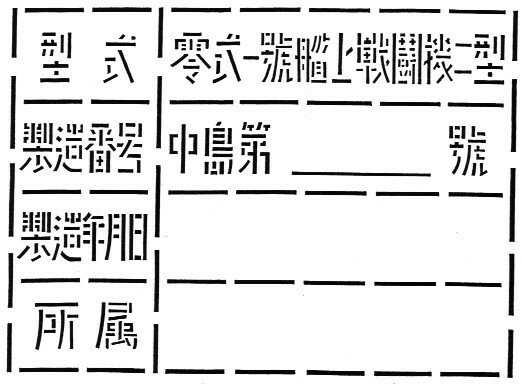 Provision was also made for including the specific assignment of each airplane in the bottom line. This article was based on several sources. Both Jim Lansdale and Dave Aiken provided a number of images of the various original fuselage stencils. Jim Long's drawings of the Nakajima stencils were also of invaluable help. 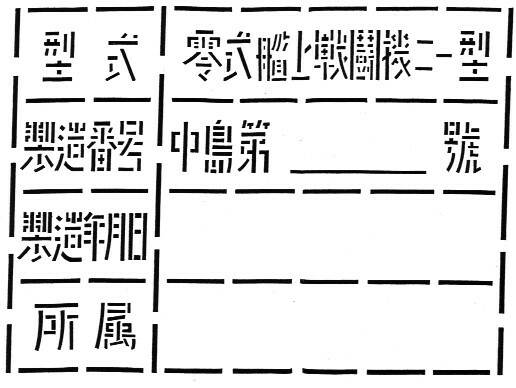 Robert Mikesh's book Zero, Japan's Legendary Fighter was the source for deciphering the changing nomenclature of the Zero. Drawing 1. 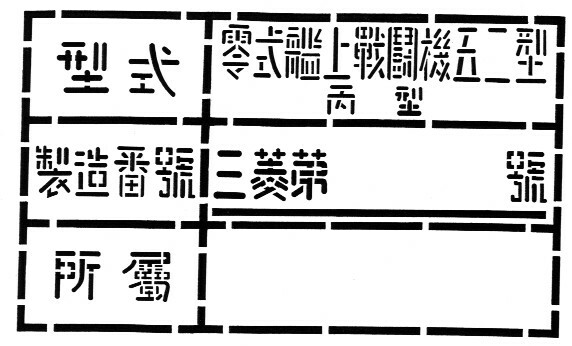 The stencil first used on at least the first twenty-five Zeros reflected the first designation of the Zero as the 12 Shi Carrier-Based Fighter (12 Shi Kanjo Sentoki). This designation was used until the Zero was accepted by the Navy on July 31, 1940. 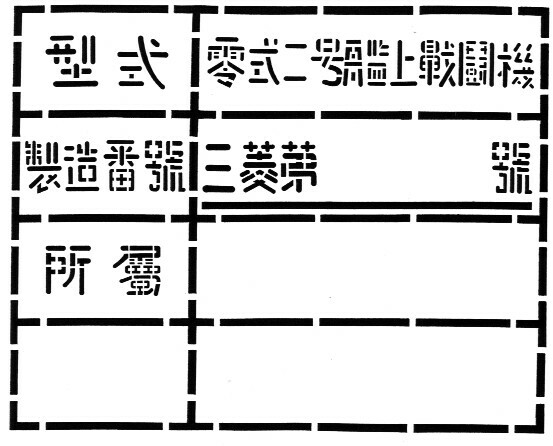 With this acceptance the nomenclature of the Zero became Type Zero Mark 1 Carrier-Based Fighter (Rei Shiki Ichi Go Kanjo Sentoki). The stencil measured approximately 290 mm high by 370 mm wide. No evidence exists, however, to indicate that the earlier stencils were changed to suit the new name, something that held true through all the other changes in nomenclature that were to follow. This drawing is based on a conjectural extrapolation of the later Type 21 pattern. Drawing 2. Starting with the sixty-seventh aircraft, Mitsubishi redesigned the Zero’s wing to incorporate folding wingtips. 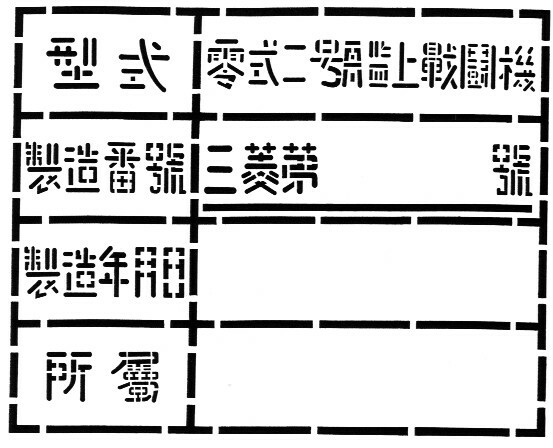 This variant was given the designation Type Zero Mark 1 Carrier-Based Fighter Model 2 (Rei Shiki Ichi Go Kanjo Sentoki Ni Gata). 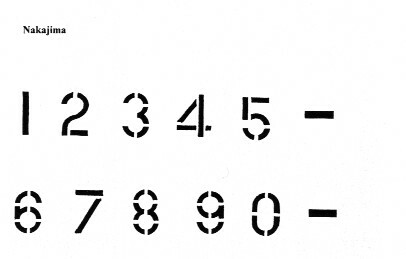 The drawing of this stencil is based on the original stencils of A6M2s s/n 4593and 3647. Drawing 3. In November 1941, Nakajima also began manufacturing the Zero and, although the designation of the airplane remained the same, the Nakajima identification stencil had a very different appearance. Nakajima’s stencil was 250 mm high by 330 mm wide, a measurement that did not vary during subsequent changes in the Zero’s designation. The illustration shown here is based on drawings done by Jim Long and the original stencil of A6M2 s/n 5355. Drawing 4. The Navy issued an order in October of 1942 that the date of manufacture was no longer to be applied on Navy aircraft. 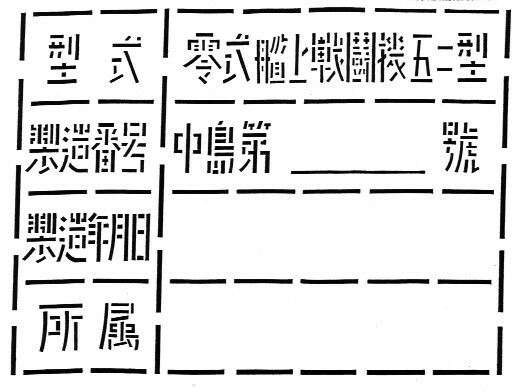 To comply with this order Nakajima left this part of the stencil blank on the Zeros they produced. 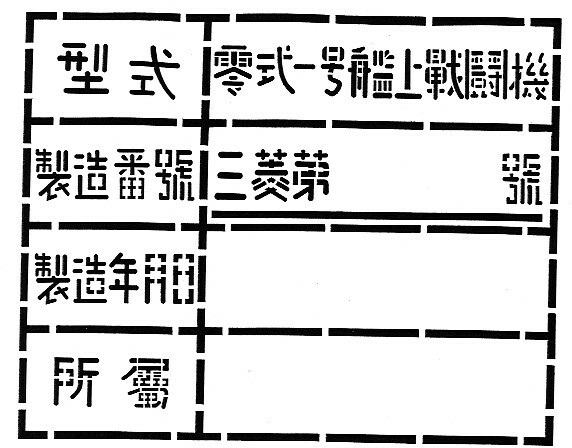 In about November of 1942, the Japanese Navy also revised the nomenclature for the Zero. 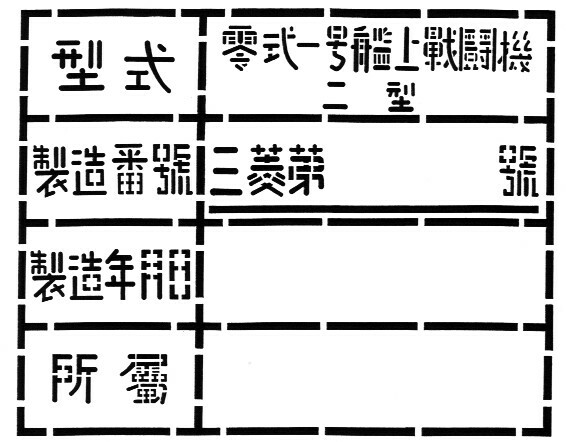 The Type Zero Mark 1 Carrier-Based Fighter Model 2 was henceforth to be known as the Type Zero Carrier-Based Fighter Model 21 (Rei Shiki Kanjo Sentoki Ni Ichi Gata). 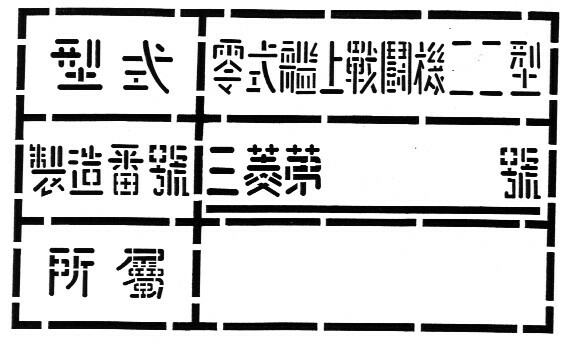 Nakajima revised its stencil accordingly. As with Drawing 3 this illustration is based on drawings done by Jim Long and the original stencils of A6M2s s/n 3471 and 9816. Drawing 5. Mitsubishi, meanwhile, began production of the A6M3 in June of 1942. As the Navy was slow in providing a specific designation for this plane it was referred to as the Type Zero Mark 2 Carrier-Based Fighter (Rei Shiki Ni Go Kanjo Sentoki). Mitsubishi also was not that quick to comply with the order coming from the Navy to delete the date of manufacture from their aircraft. As late as 29 November 1942, on A6M3 s/n 3318 the date was still being included as part of the fuselage stencil. The stencil from Zero A6M3 s/n 3274 served as the prototype for this drawing. Drawing 6. The advent of the A6M3 Type 22 in December 1942 brought about a minor change in the stencil used by Mitsubishi. The Navy still had not resolved what designation should be given to the A6M3 version of the Zero, so the previous Type Zero Mark 2 Carrier-Based Fighter name continued to be used. 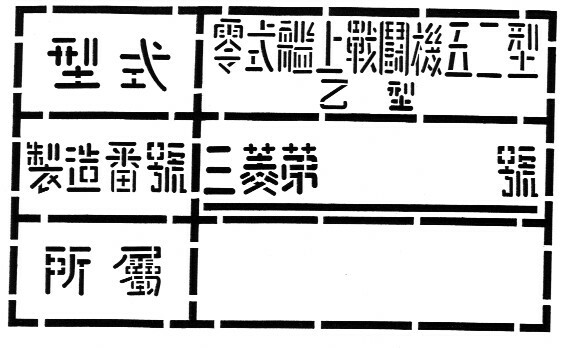 As evidenced, however, by the stencil of A6M3 s/n 3349, the sixth Type 22 to be made, the line where the date used to be was deleted and the line listing the airplane’s assignment was moved up to replace it. Oddly enough, the stencil outlining was unchanged, leaving a totally blank fourth line. Drawing 7. 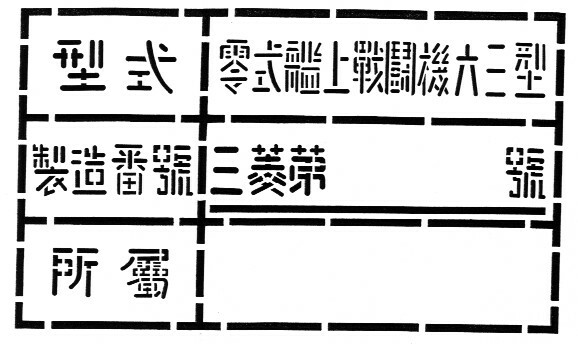 How long the previous pattern remained in use is uncertain, but it probably was changed to a three-line stencil with the adoption on January 29, 1943, of the new designation for the longer winged A6M3 as the Type Zero Carrier-Based Fighter Model 22 (Rei Shiki Kanjo Sentoki Ni Ni Gata). 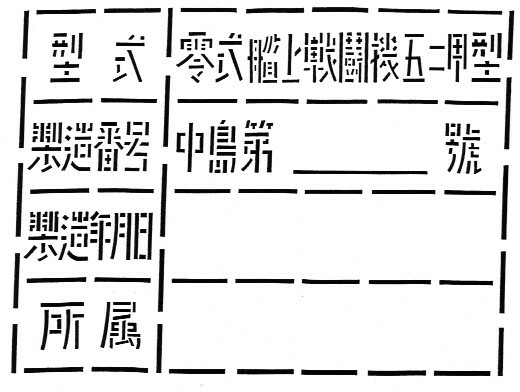 This three-line stencil measured 220 mm high by 370 mm wide. The drawing of this stencil is based on the original stencils of A6M3 s/n 3844. 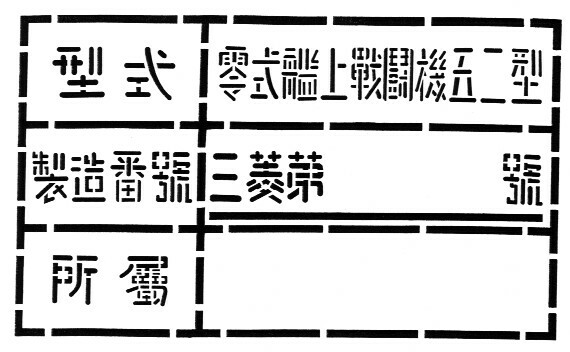 No evidence has been found to indicate that the Model 22a had this variation to its designation added to its identification stencil. Drawing 8. Mitsubishi continued to use the same three-line stencil when the A6M5, designated the Type Zero Carrier-Based Fighter Model 52 (Rei Shiki Kanjo Sentoki Go Ni Gata), began production in August 1943. This drawing has as its prototype the stencils from A6M5s s/n 4523 and 4685. Drawings 9, 10, 11. 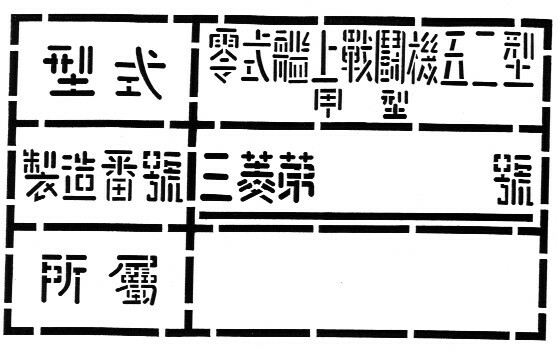 Changes to the Zero 52 prompted the additional use of “a” (Ko), “b” (Otsu) and “c” (Hei) in the nomenclature but it is uncertain as to if or when these additions were included in the fuselage stencil. The Zero in the possession of the JASDF Hamamatsu Air Base is an A6M5 Type 52a, s/n 4685, but its stencil did not include the final identifier. 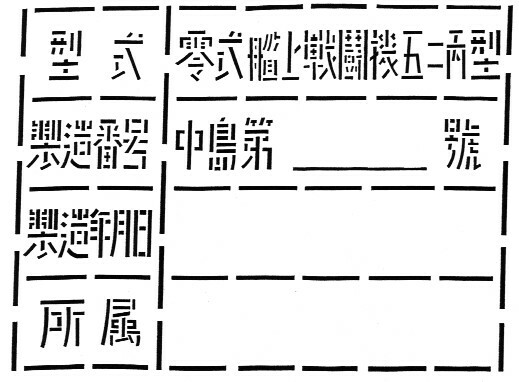 Therefore Drawings 9 and 10 must be considered to be conjectural. On the other hand, Model Art 510 includes a photo on page 180 that shows a Type 52c, s/n 5622, stencil with the complete aircraft designation. Drawings 12, 13, 14, 15. Nakajima A6M5 stencils basically remained unchanged when this company began production of the A6M5 in February of 1944. However, the first three drawings here are conjectural. 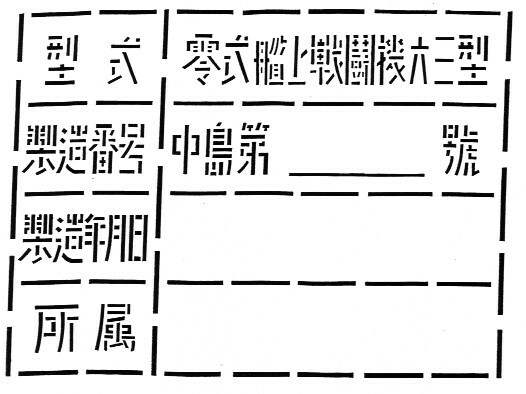 Note, as well, that it is uncertain if Nakajima stencils ever reflected the “a” (Ko) and “b” (Otsu) additions in identification. 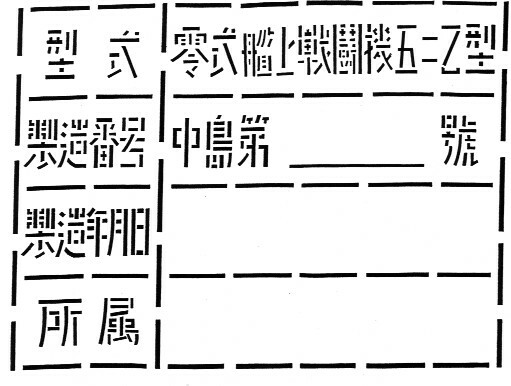 On the other hand A6M5 52c s/n 32374 did include the full aircraft nomenclature. Drawings 16, 17. It is questionable whether or not the A6M7 62 actually existed but the fuselage stencils for both the Mitsubishi and Nakajima built A6M7 63s can be reconstructed using the Type 52 stencils as a prototype. Drawing 18. 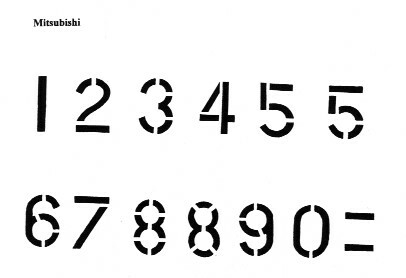 The numbers used in Mitsubishi stencils for the serial number in the second line and the date, when included in the third line, exhibited some variations but they all measured 36 mm in height. In contrast Nakajima numbers seem to have been consistent throughout the period. They were all 30 mm high.